Who doesn't love some garlic & cheese! For a filling and flavorful side or meal-starter, seasoned grits are the go-to. 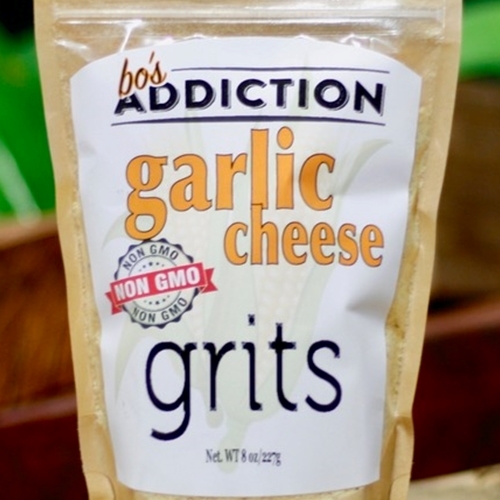 Addiction Sauces takes Louisiana's favorite grits recipes and brings them to your table with specially-blended Garlic Cheese Grits. Grits are a Deep South mainstay inimitable by ordinary cooks. Addiction Sauces gives you the secret recipe with the perfect concoction of rich cheese, zesty garlic, butter, and Louisiana spices. Smooth with just the right amount of spice, Addiction Sauces makes grits that are filling, delicious and effortless to make. Order authentic Southern grits for sale and just add water to test out true Louisiana cuisine at your own table.